SecureComm is HKC’s cloud based smartphone burglar alarm solution offering both easy connectivity and access to your security system. The HKC Smartphone Burglar Alarm App delivers remote connectivity to intruder alarm systems. Eircom ceased their fixed line SMS service on June 30th 2015. 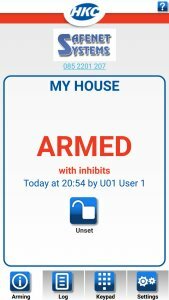 We have upgraded our Smartphone Burglar Alarm App to offer a replacement service for suitable panels. With the Smartphone Burglar Alarm App you can get push notifications with audible messaging of alerts, fully functional keypad, easy set & unset commands. The traditional intruder alarm is making way to a new breed of home security system – The Smartphone Burglar Alarm. We think it’s the best home security solution available on the Irish market. What is a Smartphone Alarm System? A home security system which communicates with a secure app on your smartphone, tablet (such as an iPad) or desktop computer. How do they differ from a tradition burglar alarm? A smart phone burglar alarm is typically wireless (although doesn’t have to be), which means they are less disruptive to install than a hard-wired system. They have all the same components as a traditional home alarm (control panel, keypad, movement detectors, door contacts, external siren etc. ), but are also connected to a secure cloud server typically via your wireless router (aka home broadband), or via GPRS signal over the GSM (mobile phone) network. The main difference is the level of ‘remote’ control you have over the alarm system and how the smart alarm communicates with you, when activated, where ever you are in the world. SecureComm is our cloud based solution offering you easy connectivity and access to your HKC Alarm system via a Smartphone app. 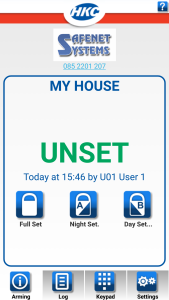 The App offers easy Set, Partset & Unset commands, an event log showing the last 100 events on your system and a fully functional keypad. For non-smartphone end users, SecureComm is capable of texting alarm activations via SMS and your system can also be controlled by SMS text commands. Available in Apple, Android and Microsoft operating platforms users can remotely set, unset, check status, interrogate the logs etc. of their security system.